As part of National Cyber Security Awareness Month Learning Tree have re-purposed two of my security-related articles—one as an info-article and the other as an infographic. 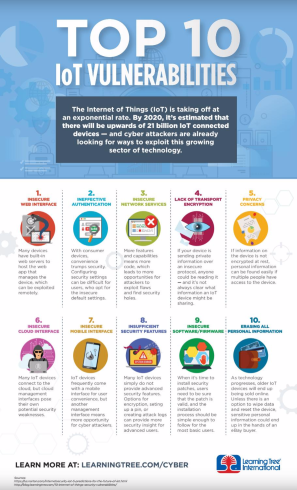 The info-article is on the problems with biometric security and the infographic is a summary of ten Internet of Things (IoT) vulnerabilities. The original biometric security and IoT vulnerabilities articles are available on the Learning Tree blog.